Your “postscript” is the best I’ve come across in my 21 years of existence. Really enjoyed your quirky take on politics! Nice summary .Enjoyed a different language. Hi SRB, Thanks mamu! Romba Nandri! Nice one Anand u summed I up well. Thanks so much Panchapakesan for reading and for the feedback. Very Nice one RSA.. One more superb blog from you.. Yes NOTA is useless unless it leads to reelection if the NOTA % is more than the rest of the candidates.. I would say that if the NOTA % say around 33%, even if it less than the winning candidate’s vote %, it should lead to reelection as 33% we insist for everything including women reservation in the parliamennt/assembly etc., it should be applicable here as well.. Very well written.. as someone mentioned your postscript is really cool.. Thanks very much MSP for your comments and value add. Hi Anand. It really is a nice article expressing the feeling of masses. After reading this a thought occurred to me. Why not have negative voting like negative marks? you can vote negatively for a candidate. Thanks Avinash! 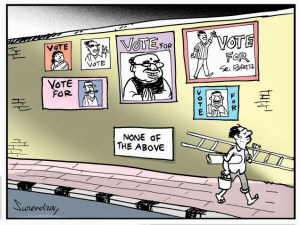 If we introduce -ve voting, most candidates will get negative votes only !!! Why would we vote for someone who was chosen by these political parties? I believe candidates should be chosen by public before they stand a chance to even compete in elections! !